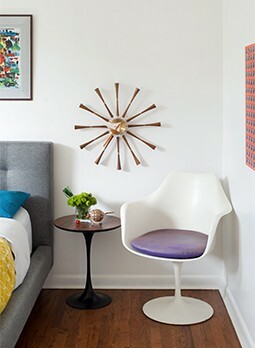 “I originally wanted a crazy Midcentury Modern home. I love the butterfly roofline especially, it’s my favorite,” Janey explains. “We saw a lot of true Midcentury Modern [homes] and even saw a few Eichlers. And what’s funny is that I really enjoyed them from the outside, but once I got inside them, I didn’t enjoy them as much,” she admits. Looking for the more functional and familiar layout of Janey’s childhood homes, the couple shifted their focus towards 1950’s style ranches. “I wanted to have two bathrooms and we needed to have three bedrooms…original fixtures were a major bonus,” says Janey. With closet space a top priority, Patrick measured their current wardrobe area to use as a comparison. “Then we started to look at houses and measure closet rods before looking at anything more seriously,” she continues. For Janey, an indoor laundry area was a requirement. “I’m not going to carry my vintage outside when it doesn’t have to be,” explains Janey. And if you haven’t seen her blog yet, trust me when I tell you that her vintage clothing collection is an impressive one. SPOILER ALERT: their new house has a dedicated indoor laundry room! 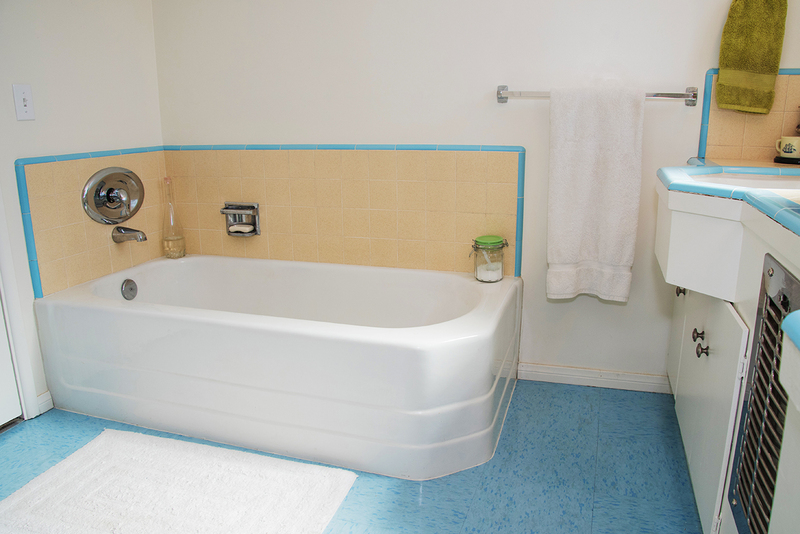 New Vinyl Composite Tile (VCT) complements the original blue and cream tile detailing around the corner tub and sink area. While there is no shower in the master bathroom, Janey and Patrick may add one in the future. Stay tuned for the rest of Janey and Patrick’s house hunting journey! For more about Janey’s home, fashion, travel, and overall vintage goodness, head to Atomic Redhead!